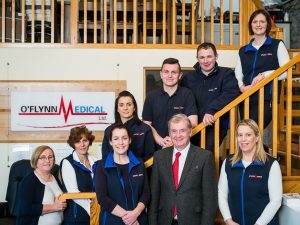 At O’ Flynn Medical, our team of dedicated professionals include highly trained service engineers, experienced product specialists and excellent office support staff. Continuous staff training and education is of paramount importance in the company to ensure our clients receive an excellent product and service – every time. If you wish to contact a specific member of our team, please click on the relevant link below. Tadhg set up O’Flynn Medical 20 years ago. When Tadhg isn’t meeting with customers and developing strategies you’ll find him driving his wife Anne around in their 2CV vintage Citroen. Conor oversees the day to day operations of the company for O’Flynn Medical and O’Flynn Innovation. When Conor isn’t in the office, you’ll find him flying down the Austrian ski slopes. Deirdre’s role involves the management, development and expansion of the company. Deirdre spends her spare time expanding her knowledge on all things “Deise” with her Waterford husband. Karen is responsible for the financial overview of the company. When Karen is not running around O’Flynn Medical chasing numbers, she’s busy running around at home after her 2 year old. Martina is responsible for the management of the office and has been with the company since day 1. Martina is a community person and when she’s not sorting us out in the office she plays a very active role in caring for her community and the people in it. Marie looks after the sales and rental for the domestic market in addition to all baby and infant products. When she’s not selling for O’Flynn Medical she’s buying for herself either instore,online or resident in Kildare Village! 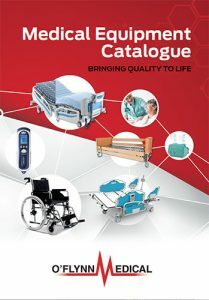 Hugh looks after the sales and rental of our medical equipment in the Munster, Midlands, Western regions. When Hugh isn’t working he’s minding the goals for St John’s GAA club. John Moylan manages the service, repair and logistical side of the business. When he’s not tackling repairs, he’s tackling up one of his horses; Daisy, Giddyup and Beauty. Annmarie oversees the decontamination process. When she’s not managing standards for O’Flynn Medical, she’s evaluating the standards of Millstreet GAA, for which her son plays. Breda works in our inhouse decontamination unit, when she’s not busy there she’s keeping fit walking the roads around Millstreet. Adrian works in our inhouse decontamination unit by day and switches over to sport mode at night keeping tabs on Newcastle United. Ian is one of our service technicians servicing equipment in Ireland and the UK. In his spare time Ian is a keen soccer player. Mike is one of our service technicians servicing equipment Nationwide. In his spare time Mike is very passionate about housework. Ann oversees customer accounts and looks after the rental desk. When she isn’t at her desk she’s cooking up a storm in the kitchen while watching Munster Rugby! Lisa looks after administration for our accounts department and O’Flynn Innovation. When she’s not working she looks after the smallies at home. Fanahan delivers medical equipment to the Cork City Region and likes to watching a Western or two. Denis looks after deliveries in the Munster / Lenister region. When he’s not teeing up deliveries he’s teeing up on the golf course. Michael looks after deliveries in the Munster / Lenister region. When he’s not travelling for work he likes to travel abroad. Mary looks after deliveries in the Connacht region. When Mary isn’t running around delivering equipment she’s running around after her grandchildren. John looks after deliveries in the Connacht region. When John isn’t running around after Mary Egan he’s running around his farm. Piotr looks after deliveries in the Munster region. When he’s not at work Piotr he uses his creative side! John looks after the Munster area; When John isn’t running around delivering for O’Flynn Medical he’s running around after the ladies at home which includes his Friesian cows. Kerry is Sales Account Manager for O’Flynn Innovation specialising in the sales of automated linen distribution systems and based in the UK. After a marathon day at work, Kerry likes to unwind by running for miles.